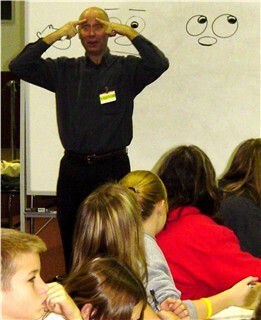 This morning, Cartoons & Caricatures' Lee P. Sauer presented lessons in cartoon history and drawing to Central Noble Middle School eighth graders in Albion, IN. Sauer discussed how Martin Luther used early cartoons to move forward his battle against the Roman Catholic Church, how Charles Philipon justified calling King Louis Phillippe of France a fathead, and how American Thomas Nast used his drawing skills to fight corruption. 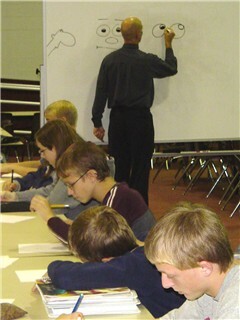 The artist then showed the students how to draw expressions and create their own cartoon characters. The programs were organized by Sara Gensic, director of young adult services for the Noble County Public Library. SURPRISE!—Sauer demonstrates how eyebrows react when a person is surprised. 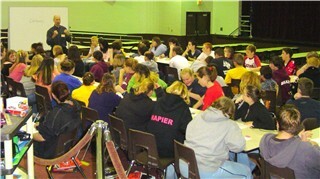 CAFETERIA CROWD—Sauer gave two 45-minute presentations in the middle school's cafeteria. THE EYES HAVE IT—The artist shows how to create expression in cartoon faces.